The shielding applied to LG's UltraFine 5K display is effective in eliminating the radio frequency interference problem induced by Wi-Fi routers, as well as other high-power transmitters like cellular towers "blocking" the same frequency, according to AppleInsider examinations. "What we believe we're seeing with some reports is similar to 'blocking' of Wi-Fi gear due to proximity of a cell tower, or other strong transmitter," our test lead noted. "Where a router may not function, or be hampered by the cell tower nearby, the proximity [of the tower] is basically mimicking the effect of a too-close router on the LG." 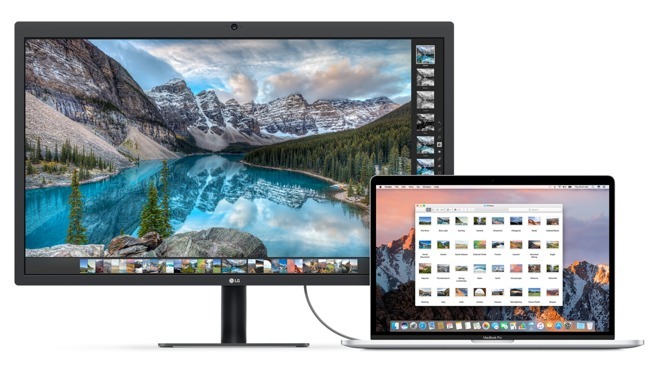 AppleInsider testers got ahold of the LG UltraFine 5K display with additional shielding on Monday, and moved the shielding installed by LG on the new unit to a problematic monitor identified last week. Following installation, the connection problems were rectified, even when exposed to a stronger signal on the troublesome wavelengths. "We used a 802.11ac router to induce the problems with the two test units, as well as a calibrated source of RF simulating a nearby cell tower," our testers reported. "After we moved the shielding to the afflicted monitors identified last week, we were unable to reproduce the connection problems previously seen." LG has urged customers that are afflicted by the disconnect problem even after moving Wi-Fi gear 6.6 feet away from the display to contact LG service for assistance. However, the process for repair or replacement of a troublesome monitor currently in-use is still not yet clear and will be dealt with on a case-by-case basis. "Talk to LG if you've got a problem," we were told by our test lead. "This isn't going to be fixed with a firmware update."